Divisa Ensemble is pleased to be a part of the Community Tuesdays Performance Series at the Oshman Family Jewish Community Center. A buffet lunch is included in your ticket price. OFJCC Community Tuesdays hosts many special events including poetry, movie screening, lectures, and a performance series. The Divisa Ensemble will be joined by the GYSO Divisa Honors Ensembles for a delightful evening of chamber music. The GYSO Divisa Honors Ensembles are chamber groups comprised of GYSO musicians coached by Divisa Ensemble members. 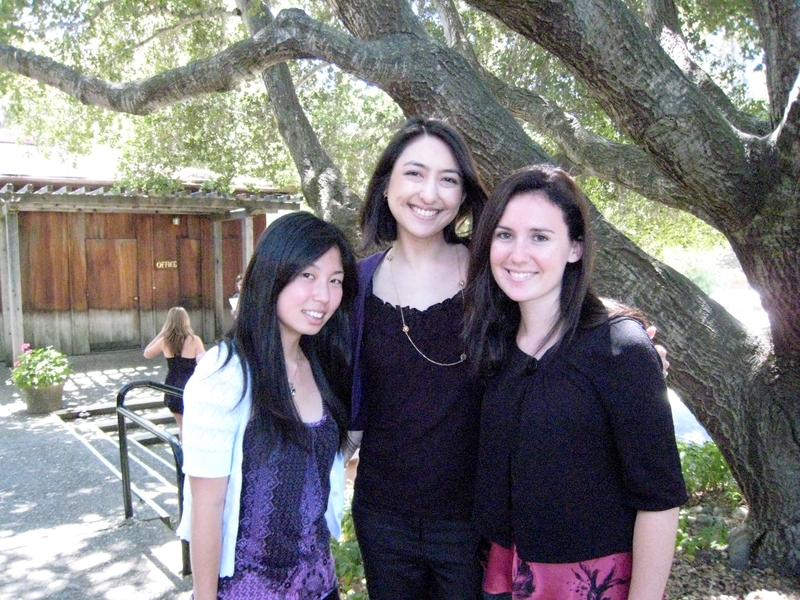 An intensive music camp for flute students ages 12-18 in beautiful Carmel Valley. The Divisa Ensemble will be joined by the ECYS Divisa Honors Ensembles for a delightful evening of chamber music. The ECYS Divisa Honors Ensembles are chamber groups comprised of ECYS musicians coached by Divisa Ensemble members. Tomiko will perform in a flute trio as part of the Fortnightly Music Club Formal Concert Series. The trio will perform Abelardo Albisi's Miniature Suite No. II and Friedrich Kuhlau's Flute Trio in G minor, Op.13, No.2. Music and Beer and Food Trucks -- it's a great combination! We'll be presenting a selection of chamber music from lots of different periods with various wind and string combinations. Have a drink, eat some food, and listen to a variety of music at this casual, family friendly event! Tomiko Tsai will perform Ibert's Piece for flute alone. Then she will be joined by Karen Van Dyke and Brenda Vahur in performing part of Uebayashi's Au Dela Du Temps for two flutes and piano, as part of the Fortnightly Music Club Formal Concert Series. The Arlington Community Church Concert Series presents the Divisa Ensemble in an evening concert of chamber music. Hear beautiful music at a scenic spot located up in the Berkeley Hills. Pub snacks will br provided with admission. Additional beverages will be available for purchase. Divisa Ensemble will share this recital with El Camino Youth Symphony (ECYS) Chamber Ensembles. The student ensembles are coached weekly by Divisa Ensemble members. Tomiko Tsai, Chiung-Lien Liu, and Chen Woo will be performing an arrangement of the Flower Duet from Lakme, by Delibes, as well as Andante and Rondo, by Doppler, both for two flutes and piano, as part of the Fortnightly Music Club Formal Concert Series. Divisa Ensemble is delighted to be featured on this concert of the National Association of Composers USA, San Francisco Bay Area Chapter. Divisa Ensemble will present a program of works by members of NACUSAsf, most of which will be world premieres. Come experience an evening of new music while supporting local Bay Area composers and musicians. Divisa Ensemble is pleased to perform again as part of the Old First Concerts Series. Come hear a chamber music concert in a beautiful and historic San Francisco landmark that is also a wonderful acoustic space. The Arlington Community Church Concert Series presents the Divisa Ensemble in an afternoon concert of chamber music. Hear beautiful music at a scenic spot located up in the Berkeley Hills. Divisa Ensemble will share this recital with the El Camino Youth Symphony (ECYS) Divisa Honors Ensemble. The Divisa Honors Ensemble are select students from the ECYS chamber music program. The student ensembles are coached weekly by Divisa Ensemble members. Tomiko will be performing Nancy Bloomer Deussen's "Rondo for Ron". She will be joined by Jeffrey Wolfield, clarinet, and Libby Kardontchik, piano. Divisa Ensemble makes their third appearance at St. Bede's Performing Arts Series in Menlo Park. Join us for a reception following the concert. Divisa Ensemble is pleased to be a guest artist of the Vallejo Symphony. Vallejo Symphony's winter concert will feature two chamber music ensembles from the Bay Area - Divisa Ensemble and Avenue Winds. This concert will benefit Philippine Typhoon Haiyan victims. A portion of each paid tickets will go to the relief effort. Divisa Ensemble is pleased to be a part of the Del Valle Fine Arts Series. Del Valle Fine Arts presents world class chamber music concerts at the beautiful Bankhead Theater in downtown Livermore, California. 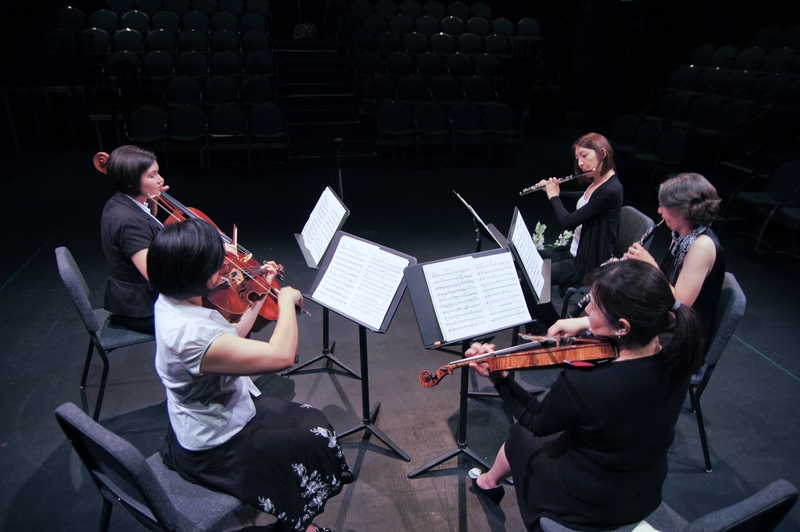 Divisa Ensemble is pleased to be a part of the Pacifica Performances Concert Series. Pacifica Performances showcases a variety of musical styles including jazz, blues, guitar, world, Celtic, and Classical. A camp for flute students ages 12-18 in beautiful Carmel Valley. Divisa Ensemble is pleased to be a part of the Old First Concerts Series. Old First Concerts is a year-rounds concert series that presents an array of programs performed by musicians from the San Francisco Bay Area and beyond. Divisa Ensemble is pleased to be a part of the Manteca Kindred Arts Series. Manteca Kindred Arts has presented classical artists from the Central Valley, Bay Area, and artists of National and International status. Divisa Ensemble is honored to perform two pieces by local composer Nancy Bloomer Deussen: "San Andreas Suite" for flute and strings and "Two Pieces for Violin and Piano" at the Fortnightly Music Club's Season Opening Concert. Divisa Ensemble opens their 4th Season as part of the St. Bede's Performing Art Series in Menlo Park. Join us for a reception following the concert. 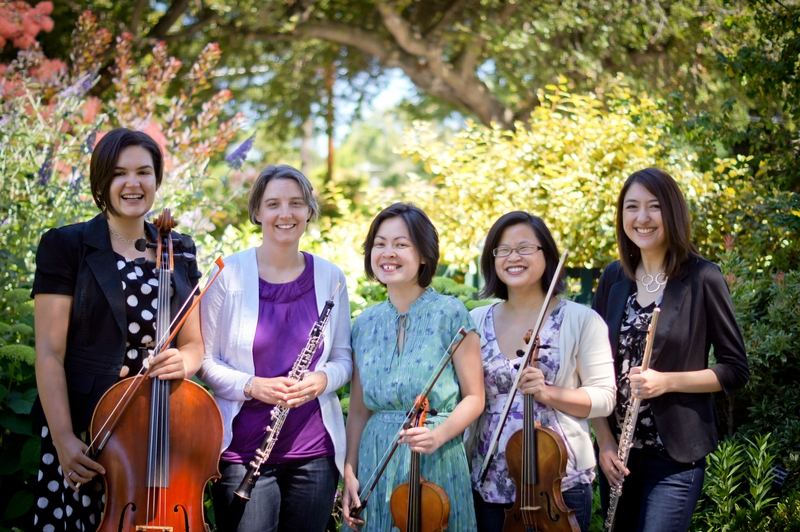 Divisa Ensemble will perform various chamber works as part of Palo Alto World Music Day. Palo Alto World Music Day is a music festival that takes place every year in downtown Palo Alto on University Avenue. All performances are free and open to the public. Tomiko Tsai and Adrienne Malley will be performing Eugene Bozza's Trois Pieces for flute and oboe, as part of the Fortnightly Music Club Formal Concert Series. Divisa Ensemble is pleased to be a part of St. Bede's Performing Arts Series. The performance will feature chamber music for mixed winds and strings. Divisa Ensemble is pleased to be a part of St. Bede's Performing Arts Series. The performance will feature chamber music for mixed winds and strings by Beethoven, Besozzi, Borodin, Cannabich, and local Palo Alto composer Nancy Bloomer Deussen. Silent auction and recital benefiting a camp for flute students ages 12-18 in beautiful Carmel Valley. Recital will feature performances by the camp's faculty members. A rare opportunity, not to be missed! Featuring chamber music for mixed winds and strings by JC Bach, Tann, Villa-Lobos, Janitsch, and Roussel. Pieces by Mozart, Ponse, Cambini, Dohnanyi, and Uebayashi will be performed by different mixed ensembles. Featuring Tomiko Tsai and Betsy Cameron performing the Two Flute Concerto by Cimerosa.